President Trump’s statement about the poor state of US – Russian relations, “I hold both countries responsible. I think that the United States has been foolish. I think we've all been foolish. We should have had this dialogue a long time ago -- a long time, frankly, before I got to office. And I think we're all to blame,” seems to have sent the establishment media and #NeverTrump crowd into chicken little-level fits of hysteria never before seen in American politics or media. 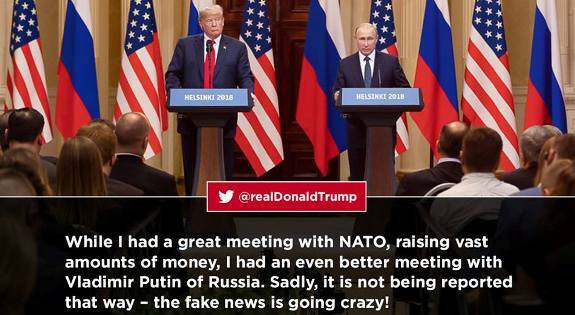 Pearl Harbor, Kristallnacht and treason were just a few of the insane comparisons Democrats and #NeverTrump Republicans have made to denigrate the President’s performance in Helsinki. With all the brouhaha about what Trump said or meant to say during his post-Summit news conference with Putin one important thing seems to be lost on Trump’s critics. What those who are demanding that Trump believe and defend the American “intelligence community” are asking is that he defend the failures of his predecessor. And even more bizarrely, they would require him to believe and defend the very people who have been proven to have lied, who tried to defeat him during the election and have been working to undermine or even overthrow him once he was elected. That Russians try to sow discord and interfere in the elections of states they perceive as adversaries is not new and not news to anyone who knows their history. You can watch a quick two-minute history of Russian election ops through any one of these links (extended content in third link). But it wasn’t Russian President Vladimir Putin who texted “We’ll stop him” when Donald Trump won the Republican nomination for president. So, what is new, and not only newsworthy but extremely dangerous to the future of constitutional government, is the FBI, CIA and other security organs of the United States government actively interfering in an election and actively trying to undermine the newly elected president once elected. And that makes this more than an academic question: Who should Trump believe, the guys he knows tried to screw him, or the guy they are trying to blame for the failure of their efforts? It should never be forgotten that those demanding that Trump accept the conclusion that Russia “interfered” in the election are asking the President and everyone else to accept as fact something that has yet to be proven in court. What’s more, the facts and charges alleged have constantly evolved. But what hasn’t evolved or been refuted is the animus that senior members of the Obama-era intelligence community, notably former FBI counterintelligence second in command Peter Strzok, former CIA Director John Brennan and former Director of National Intelligence James Clapper have displayed toward President Trump. And all the acts of Russian election “interference” alleged happened on their watch. Never in the annals of Washington DC’s history have three bureaucrats been so anxious to shout their failures from every rooftop. But that’s exactly what Strzok, Clapper, and especially Brennan have been doing by blasting Trump for not picking a fight with Putin over their failures. Constructive dialogue between the United States and Russia affords the opportunity to open new pathways toward peace and stability in our world. I would rather take a political risk in pursuit of peace than to risk peace in pursuit of politics. It would be a folly for President Trump to pick a fight with Putin over the failures of Obama’s national security team and to sacrifice the opportunity to build better relations with Russia over the incompetence of Peter Strzok, John Brennan and James Clapper, upon whose heads the failure to stop the alleged Russian interference in the 2016 election rests. Submitted by email_registrat... on Wed, 07/18/2018 - 19:15.